Many people will attest to my wife’s culinary skills. She prepares imaginative dishes and when appropriate, does so with panache. Her cheesecakes first come to mind, but already I digress. “Robin! Come Here”! The summons, reminiscent of Horace Rumpole’s “She who must be obeyed” could not be ignored, so I obeyed. Something was very much amiss in the kitchen. To accompany fresh wild salmon fillets, my wife had roasted a mixture of vegetables brushed with oil on an aluminum tray. 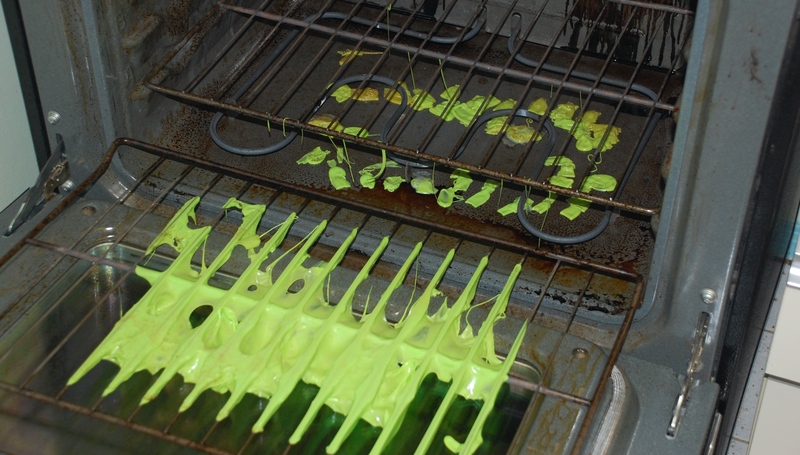 As she removed the tray, the image below unfolded, a yellow-green slime, soft and gooey when probed, hard as a brick after cooling and slightly noxious. Obviously, it was not what she’d intended. We had discussed purchasing a new stove and the goo gave me a scare. Had old age discharged our oven’s innards or had the heat encouraged some self-cleaning microbe to grow, vaccine like, while our veggie’s simmered? Were we inhaling a carcinogen? Pragmatically, I figured a chemical reaction between the aluminum cookie sheet and the oven heat had occured, so I called my chemist brother-in-law who had developed the first non-stick surface for self cleaning ovens. I also e-mailed him the photograph above. After describing the goo, I asked, “Was ist das?” He said, “It’s a thermal plastic reaction”. “Thanks” I said, “but where’d it come from?” He didn’t know, but suggested we might be possessed. I chuckled and told him I’d send the photo to Martha Stewart and no closer to solving the mystery, I hung up. 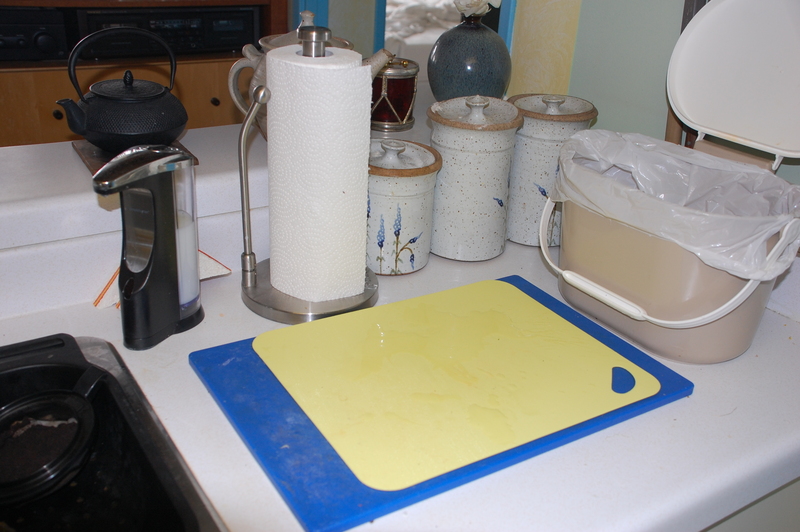 My wife pointed to her blue plastic cutting board and Dean said, That’s too thick.” But my wife ignored him and exclaimed, ” Oh no. My small cutting sheet is gone”. The bottom of the aluminum tray had been damp while resting atop a thin piece of plastic. The plastic sheet stuck to the tray bottom unnoticed and was roasted along with the veggies. That little sheet had given up its life for goo. A plastic slicing sheet similar to the one that was roasted. 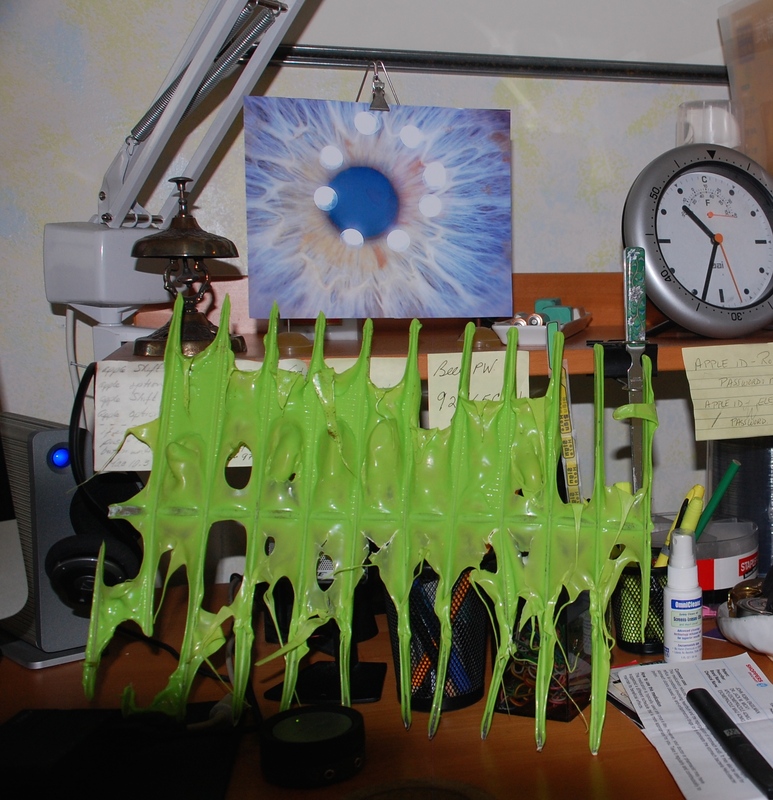 The Goo skeleton Deen peeled from our oven rack. As you have so graciously agreed to my visiting Toronto this Thursday through Saturday. to pick up your marvelous Deagan marimba, and partake of whatever culinary delights Eleanor has in store, respecting our diets, of course…or not.. I am truly glad you got this little episode out of the way. See you Thursday. Go Muckdogs!! HA, that’s unlikely!! What about GO JAYS ! !